Sim card data recovery software retrieves all deleted and lost text messages (popular as SMS) and phone numbers from mobile phone sim card. 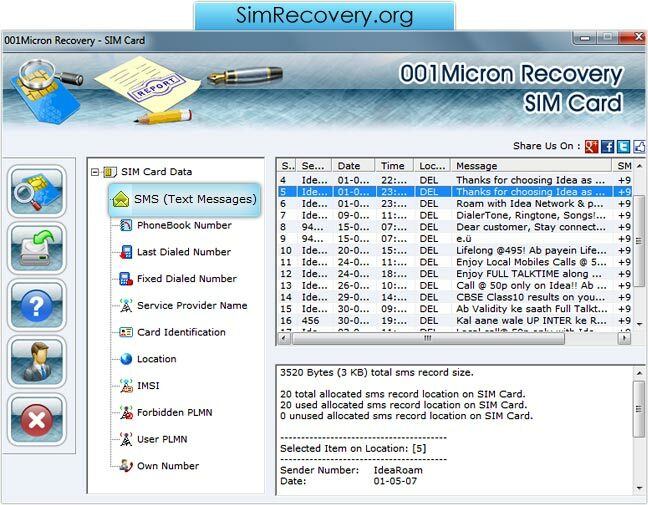 Sim recovery software requires USB Sim Card Reader (of any PC/SC standards or Phoenix standard based USB sim card reader hardware device) to restore information from logically damaged or inaccessible mobile phone sim card. Sim card recovery program restores all lost inbox sms and outbox text message from major GSM mobile phone network service provider of any country or region. Sim Card Recovery program saves the recovered data in text format at user specified location on your Desktop or Laptop PC for future reference. Sim card recovery program is easy to use and does not require any special training or technical skills to operate it. Sim Card Data Recovery Supports Recovery of - Text messages, Phone book contact numbers including (Last dialed numbers, Fixed dialed numbers). Retrieves Basic Information about Sim Card - IMSI (international mobile service identity) and ICC identification number of the sim card, Service provider name, Location/Manufacture of the Sim card. Investigation Use - Software is used as forensic tool by investigating officers or forensics agency. Help Manual - Sim card information retrieval software provides a complete inbuilt help manual for assisting user while working with sim card data retrieval software.